Luna is a large, family-run business that was founded in 1958. The company offers in-home flooring consultations throughout the nation, during which the salesperson shows samples of carpet, hardwood or laminate flooring to the consumer. The Luna sales team is pretty easy to schedule an appointment with. The Luna website has a scheduling feature that can set a meeting. The Luna representative should arrive on time with their bundle of samples. It needs to be noted that interested buyers are given a time range in which the salesperson will arrive, so a couple hours of at-home wait time should be expected. Luna estimates include installation and removal of old flooring, and they do offer a low price guarantee. The company also touts their Love Your Floors Promise, which allows buyers to replace their new flooring at no cost. This perk can only be used once, and labor is excluded. Flooring also comes with a limited lifetime installation warranty, so any problems due to installation will be fixed for free. 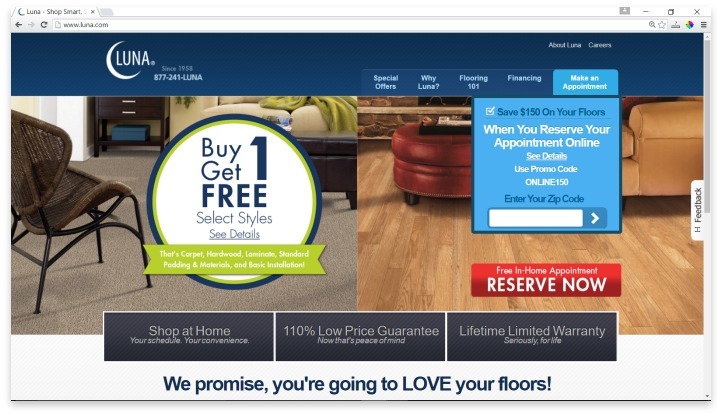 Often, Luna runs promotions that allow for volume discounts for consumers who want new flooring in more than one room. Luna carries a range of carpets, wood flooring, vinyl and laminate from some of the top brands in floors, like Armstrong, Staimnaster, Shaw Floors, Mohawk, SmartStrand and Bliss by Ballard. Carpet comes in texture/plush, twist (Frieze), Berber, and pattern styles. Hardwood buyers can choose from engineered or solid Oak, Maple and Cherry. Wood laminate and luxury vinyl sheets and planks are also available for purchase. Luna has a terrible online reputation. In fact, it’s hard to weed out a good review amongst the bad. The many complaints include borderline bait-and-switch sales tactics when it comes to prices, which includes customers being quoted one price and then being charged more at the time of installation. That is, if the salesperson even shows up. There are many consumers who made statements about waiting throughout the scheduled time window, only to call and find out that no one is coming. Other consumers were troubled with the installation schedule. Luna states on their website that they cater to consumer’s schedules, but there are numerous examples of people taking the day off work to ensure they’re home to let the installers in, only to be told in the afternoon that their appointment has been rescheduled to the following day, or the installers arrive late and don’t have enough time to complete the job. There are also complaints about the quality of products, that include problems like fraying carpets. The worst grievances include damages to the consumer’s home. Luna offers in-home flooring consultations with a large carpet selection, and a low price guarantee. There are some definite risks in making a purchase from Luna. It seems as though there is incompetence at every step of the process, which is frustrating to consumers and that reputation has been talked about extensively online. That being said, Luna is an affordable option for those on a budget. However, there are many flooring retailers who are affordable and don’t suffer from the same negligence, or at least not at such a high rate. Have you had an experience with this company? Please share your Luna reviews below.